If you own a vehicle in Idaho, you have 30 days to register a new vehicle and 90 days to register an out-of-state vehicle. Every residence in Idaho must register their vehicles with the Division of Motor Vehicles (DMV). If you’re new to the state, you have 90 days to find a DMV and change your out-of-state plates to a new set of Idaho license plates. For those of you who are purchasing a new vehicle, you have 30 days to register your new vehicle. Buying from a car dealership performs the registration process on your behalf. However, purchasing from a private seller requires temporary plates to drive legally after the sale. You can contact the DMV for temporary plates if you are considering a car from a private sale. You will register your vehicle at the DMV and submit the appropriate paperwork and payment. When you’re applying for you license plates, you’ll have the choice for standard, personalized, or specialized license plates. 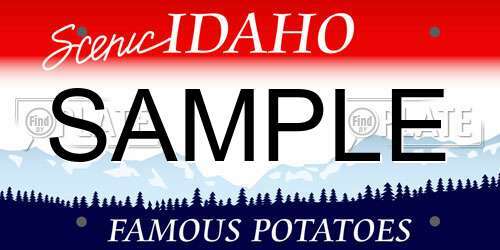 You might be familiar with the red, white, and blue background with “Scenic Idaho” and “Famous Potatoes” written across their standard plates. This is the type of license plate you will receive when registering your vehicle in Idaho. You will be required to place this license plate on the rear of your vehicle and the registration sticker must be visible in the bottom right corner. You may also require an additional license plate for the front, depending on your vehicle (i.e. cars, vans, and trucks). You must create a unique plate number in order for your application to be accepted and processed. You can order personalized plates online, by mail, or by visiting a DMV office in person. There are numerous clever and beautifully designed license plates representing organizations, charities, and other causes. These license plates may have eligibility criteria or require a special donation before you can receive them for your car. You do not have to pay for these specialized plates until your application has been approved. If approved, you have to pay the fees associated with that plate as well as the additional renewal rates. Note: You may also be responsible to pay service fees, local taxes, and other fees related to your registration and renewal. In Idaho, you are not required to contact the police should you suspect that your license plates have been stolen. If this happens to you, you can apply for replacements at the DMV office nearest you. If you no longer need your license plates, you can surrender them to a DMV office in Idaho. In case you can’t go in person to the office, you can also mail them in. When you register your vehicle, the license plates assigned to you become your property. If you sell, donate, or trade your vehicle, your plates can be transferred to your next vehicle. If you own a classic car that has an antique license plate, you may be required to transfer this license plate along to the new owner. Here you can search for any license plate in Idaho or other states across America. You can use this search tool to find available license plates to personalize yours. Additionally, FindByPlate lets you look up reports for different vehicles. Try it, all you need is the license plate number and the state it comes from to obtain results.